• Larger Deck Area: Deck size has increased by more than 400 square inches — accommodating loads up to 5,000 pounds. • Cart Weighs Less: We reduced the weight of the TS Series carts 5% to 14% depending on the model — helpful during setup on track, and for portability and storage. • Steel-perforated Deck Area: Cart has a strong, perforated steel deck, to help keep loads from shifting. • Parking Brakes on Both Ends: Now available on all models, both ends of the cart have parking brakes, providing stability and safety on track grades and during loading/unloading operations. • Easy Two-direction Travel: Cart can be pushed in either direction without removing cart from track by removing the detachable handle from one end and inserting into the opposite end. • Insulated axle with cast aluminum (or special ductile alloy) wheels with pre-greased, sealed ball bearings. TS carts are built for standard 56-1/2? track gauge, but can be custom-built for a wider track gauge. 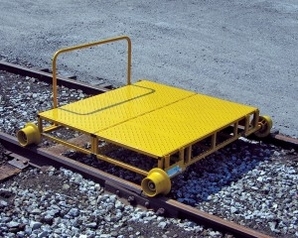 • Cart Assembly: By positioning the two halves of the cart on the track, raised in the center with all wheels on the rail, and joining the two interlocking ends, the two pieces can be gradually lowered onto the track as the ends fit together to create a single unit. • Safety Latch Pin: Setting the safety latch pin locks the two halves of the cart together, preventing the separation of the assembled cart. After use, removing the safety latch allows the two halves to be lifted upward and separated for easier removal and storage. • Parking Brakes: Setting the parking brake on the TS Cart is fast and easy, and secures the cart during loading and unloading. The parking brake can also be set when on inclines to help stabilize the cart. • Perforated Steel Deck: The TS series cart’s new, perforated steel deck is an improvement over the expanded metal because it provides increased strength, yet still provides for minimal load slippage.